Resource link building is a strategy where digital marketers find a relevant site that contains a page where their resource would add value and pursue a link there. Sites are considered relevant when placing the resource link there would make sense and would actually provide value to the audience of that site. Performing a resource audit. Make sure that you have something worthy to be linked, such as case studies and guides, scientific papers, customer surveys, free tools, calculators, checklists, aggregated lists, FAQ content, and the like. Prioritizing resource link building opportunities. Check site status (live or dead), external links (less than 100 outbound links is best), site authority metrics, contact information, industry/topic relevance, and broken links on pages. Emailing opportunities. Contact webmasters or site owners. Use templates to save time and improve outreach accuracy. Email No. 1 – Compliment the webmaster/owner on the page content and let them know of any broken links. Ask if they are still updating the content with good resources. Don’t ask for a link yet. Email No. 2 – If the webmaster doesn’t reply, send a follow-up email. Email No. 3 – Once the webmaster or site owner gives a positive response, email them back with the resource information (broken links and your recommended resource links, your own link included, with an explanation about why these would be helpful or relevant to the webmaster’s site). Resource Link building as an outreach tactic that involves a content-focused strategy that highlights linking opportunities within an article or blog post. The process includes looking for internal references which the webmaster can use as informational links and add external links to help readers learn more about the topic. Resource Link building is the process of getting your website included as one of the resources within an article or blog post. 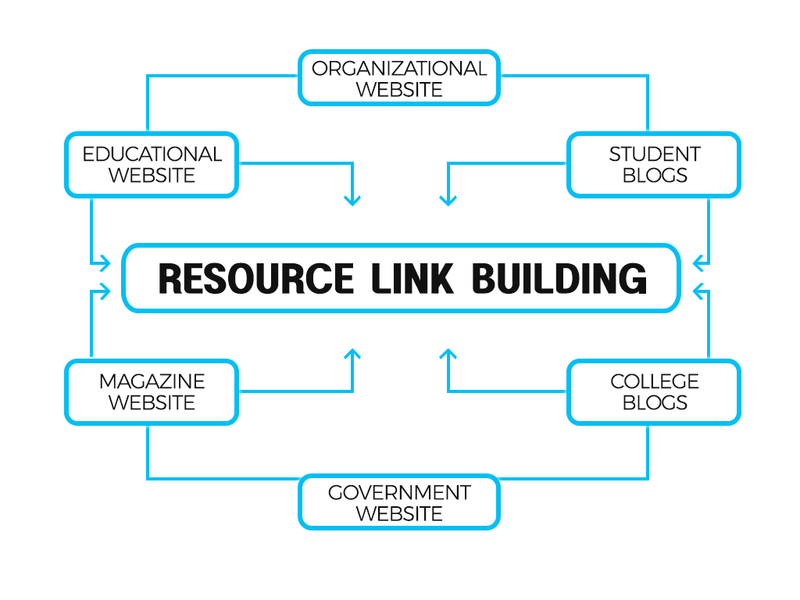 This type of link building strategy is widely used by Digital Marketers to gather .EDU, .GOV & .ORG domains. Resource link building, in my opinion, is the best white-hat strategy because is appeals to the needs of the users and helps webmaster learn more about internal links as well as the importance of informational links. Resource link building is a link building strategy that involves contacting webmasters and helping them with a resource or informational links. This gives webmasters a very good opportunity to apply internal links that pass relevance and feature external informational links from authority websites. The intent is to help visitors learn more about a topic by adding as much information as possible. SEO companies struggle with link building so we decided to share some Search Engine Optimization insight to make the web great again! This step involves finding the right type of websites that match your client’s industry. You will need to have a good understanding of your client’s keywords and goals in order for resource link building to be effective. Let’s say you have a client in the car rental industry and the focus keyword is simply “car rental”. You will need to find the best websites that will give you the most value in terms of traffic and link juice. In this test, you will see .EDU domains since the Search Operator indicated we wanted to look for the Keyword: “car rental” and we requested Google to show us domains that contain .EDU within the URLs. This cuts down the prospecting time since the Google Search Engine Results Page showed us EDU domains that already have the word car rental. Collect the URLs and save them in a spreadsheet then move on to the next step. Google – Duplicate check by copying parts of the content and pasting them into Google Search using quotes “content” – which translates to exact match. Copyscape and Siteliner quick duplicate check on and off page. MOZ – for the ever popular none Google metric Domain Authority / Page Authority – Not a ranking factor but gives us clues how strong a website is according to MOZ. Ahrefs – For Anchor cloud, backlinks and content ideas. Screaming Frog – Meta Data, Analytics, Response codes, header and so much more. Here’s a quick link to Search Operators. Assuming you already have a list of 10 or more websites we then qualify them further by taking a deeper look at the indexed pages. Using the site search function via site:domain.com + keyword allows you to look at all pages that have your desired keyword. You can now see linking opportunities but we want to make this better and it really doesn’t make any sense to target a blog post from 2009. Let’s Use Tools to get results according to freshness. Now that you have a very good target page, you will need to appeal to the webmaster or site owner by influencing them to practice internal linking and adding authority links to help their visitors consume content better. Great! We managed to find resource opportunities. Now it is important to note that you will need to find internal resources first before you position your client’s website. Follow the old school link building rule and include another external but authoritative link. Make sure you execute a Site Search when looking for references internally. Once this stage is complete you can now create your email template for outreach. Now the outreach part is simple. I may have touched some points in this post earlier but here it is in a nutshell. Find contact information via About Us, Contact Us or Google the author names. You may also try viewing the source code and look for email or mailto information. Create a simple template that tells the recipient exactly what you want to do or tell them you noticed missing information that can be crucial when it comes to research. I’m a licensed “your title” / student researcher – I recently visited your site while researching for an article I’m working on “niche & geo target”. This is a note for your webmaster, as I found resources on your site that visitors like me would surely appreciate. And while you’re updating your page, I included some further resources that could help people struggling with similar issues. I also updated the content a bit and made some corrections on misspelled words. <– Go the extra mile! Make sure you contact the right person and you can add other things you noticed like broken links and images to get more positive replies. That’s Resource Link Building simplified. If you have any questions, leave a comment or contact us.